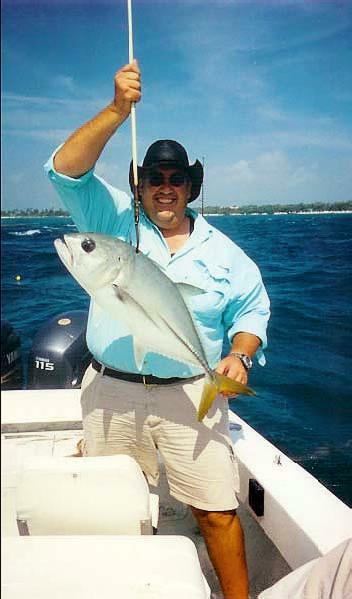 Big John happily reels in his catch, a great Horse-eyed Jack, perfect for the grill! Outside the Reef: Plenty of mahi mahi are still being caught along with yellow eyed red snapper and grouper. I’ve seen large schools of tuna feeding outside the reefs now. Inside the reef: Horseyed jack are spawning this month and are caught easily in passes. I’ve been catching both mutton and grey snapper in cuts in the reef. Flats: Silky snapper, permit, barracuda and bone fish have provided anglers with action this week. Horse eyed jack-similar in size and appearance to his cousin the jack creville, horse eyed jacks have a more curved head and larger eyes. These fish are known as real brawlers to sports fishing anglers. I usually catch them in fast moving schools from the surface to depths of 60 feet. Lone horse eyed jacks can be caught as deep as 400 feet. They can be caught on mullet, sardines, jigging, spoons and even flys. When I am grouper fishing, I will typically see schools of 10 to 20 passing right under the boat. If I am quick enough I and can get baits down to their depth in time, I can get at least two on before they move on. Throwing a dozen live sardines in the water as soon as I see them sometimes can keep them around the boat longer. By doing this I’ve been able to land dozens of these fast hard fighters in a go. Like their cousins, the jack creville, amberjack and black jack, horseyed jack are always back breaking fighters that grow to a size of up to 38 inches. Fish of 20 inches are more common. No matter what size they are, these fish are packed with 100 percent pure fight. And they make a nice complement to any barbeque grill at the end of hard day’s fishing.